Tomorrow is going to be patch time again and we would like to announce the patch notes in advance. A lot of players have been asking us when the next patch was going to be so here it is. As of right now we plan on patching tomorrow morning. 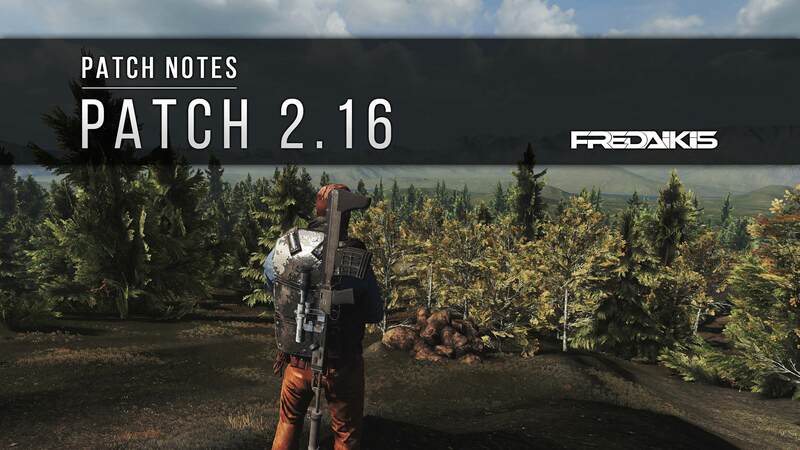 This patch does NOT contain the new Open World / Survival map yet, sorry about that! Please read more information about that map in these patch notes. With this patch we mainly aim to fix a lot of issues and crashes and at the same time we're adding a bunch of new content. We have reworked some skinboxes and Easter content is implemented in this update. Please stay tuned for further information about the Easter Events. On top of all this we also have some Anti-Cheat updates and we fixed a lot of issues in the game. To summarize a nice and relatively big update. Fixed a major crash. We literally fixed the most common crash. 80% of the crashes were because of this so we are very happy we fixed that! Daily rewards have been improved / updated: Removed some "irrelevant" items such as the zombie repellent. Also removed the car spawners due to the recent change we did with the vehicle system. We increased the chance of the karambit. Added the thompson, ghillie suit, ballistic shield. Fixed an issue causing some players to join random groups in-game. Added a new "SELECT YOUR REGION" initial page for new players, many of them don't know what region they are even playing in. Fixed a problem related to some body parts of the "Club Promoter" character. Some body parts had a rig problem where there was a triangular shape on the top right arm of the character clipping through. This is fixed. wooden_house_01- Optimized the model. This model is only used in the trading lounge map. zombie_vista_01 - This model was used in some maps as a scenery (like mountains) outside of the map to fill up "emptyness". This model was extremely unoptimized and is now completely optimized. props_utilitypole_x1 - Created and fixed LODs. Also optimized original model. props_utilitypole_s_x3 - Created and fixed LODs. Also optimized original model. props_utilitypole_s_x3_end - Created and fixed LODs. Also optimized original model. props_utilitypole_x3 - Created and fixed LODs. Also optimized original model. props_utilitypole_x3_end - Created and fixed LODs. Also optimized original model. props_windturbine_01 - Created and fixed LODs. Also optimized original model. sp_props_windturbine_01_dmg - Created and fixed LODs. Also optimized original model. junk_pile_cars_01 - Created and fixed LODs. Also optimized original model. prop_fountain_01 - Created and fixed LODs. Also optimized original model. prop_jack_pump_01 - Created and fixed LODs. Also optimized original model. prop_planter_01_cylpot - Created and fixed LODs. Also optimized original model. prop_planter_02_rect - Created and fixed LODs. Also optimized original model. prop_planter_03_rect - Created and fixed LODs. Also optimized original model. prop_traffic_block_01- Created and fixed LODs. Also optimized original model. wz_freeway - Created and fixed LODs. Also optimized original model. NZ_School - Optimized original model and created LODs. Airtower_01 - Fixed a weird shadow problem related to this building. Also opened the entire downstairs area and added two more doors. Also added several extra windows to prevent players from camping in certain areas in the stairs. On top of that we have also made the top roof slightly bigger to prevent players from glitching on top of there. Also created and applied LODs. town_postoffice_01 - Created and fixed LODs. town_clinic_01 - Created and fixed LODs. town_warestore_01 - (Big Market) Created and fixed LODs. Also fixed the glitch where players could glitch through one of the outside walls. city_building_10 - (5 Story) Created and fixed LODs. Also fixed the stairs so players can jump up the stairs without getting stuck / crouch. bld_tent_02 - Created and fixed LODs. Also optimized original model. Easter_Statue_01 - Added this model including LODs specially for the Easter event. Who is going to be the first to find one placed in one of our maps? Improved the vehicle system related to vehicles hitting zombies. This should overall be better and improved now. Zooming in before entering a vehicle no longer provides zombie aggro immunity. FAC 2.0 has been in development for a couple of months now and is finally getting finished as we speak. Starting from the next upcoming patch we will start integrating FAC 2.0 in the game where we will start off with a lot of testing. We will keep you guys updated along the way and hope to have FAC 2.0 ready very soon. One of the biggest improvements on FAC 2.0 is the fact it is a much 'lighter' version of FAC which will in turn result in much better performance and less CPU/RAM usage on the game. Added a new clan riot shield: Riot Shield Yoku. This is for the clan who won the New Z Asia Cup of 2018! Added a new clan riot shield: Riot Shield EVG7. This is fro the clan who was second place on the New Z Asia Cup of 2018! Updated: Riot Shield TGOD. This is fro the clan who was third place on the New Z Asia Cup of 2018! Added a new skin for the M. Style Helmet: M. Style Helmet Fallen Angel. Added a new skin for the Custom Guerilla: Custom Guerilla Fallen Angel. Added a new skin for the Custom Guerilla: Custom Guerilla Fallen Angel Chrome. Added a new skin for the Custom Guerilla: Custom Guerilla Fallen Angel Fun Edition. Added a new skin for the M4A1: M4A1 Brutalizer. Added a new skin for the K. Style NVG: K. Style NVG Serenity. Added a new skin for the IBA: IBA Chrome Blue. This skin is more of an "experiment" to see for us how colored chrome would look like and what players would think. We are not sure when / if this skin will ever be released. Added new character clothes for Average Joe based on the Modern Black Skinbox. Added a new skin for the Blaser R93: Blaser R93 Fun Edition. Added a new skin for the IMI-TAR-21: IMI-TAR-21 Fun Edition. Added a new skin for the Moto Helmet: Moto Helmet Fun Edition. Added a new skin for the MTV: MTV Fun Edition. Added a new skin for the SIG SAUER 556: SIG SAUER 556 Fun Edition. Added a new skin for the SVD: SVD Fun Edition. Added a new skin for the M9 NVG: M9 NVG Fun Edition. Added a new skin for the Small Backpack: Small Backpack Fun Edition. Added a new set of clothes for the Rebel character. Added a new light sword skin: Light Sword Cross Blue. Added a new light sword skin: Light Sword Cross Yellow. Added a new light sword skin: Light Sword Cross Pink. Added a new light sword skin: Light Sword Cross Green. Added a new light sword skin: Light Sword Cross White. Added a new light sword skin: Light Sword Twin Rainbow. Added a new light sword skin: Light Sword Twin Blue. Added a new light sword skin: Light Sword Twin Yellow. Added a new light sword skin: Light Sword Twin White. Added a new light sword skin: Light Sword Twin Pink. Added a new light sword skin: Light Sword Twin Green. Added a new light sword skin: Light Sword Curve Green. Added a new light sword skin: Light Sword Curve Pink. Added a new light sword skin: Light Sword Curve White. Added a new light sword skin: Light Sword Curve Yellow. Added a new light sword skin: Light Sword Curve Blue. Added a new character clothes that match with the Jedi skins. Added a new skin for the Small Backpack: Small Backpack Easter Bunny. Further information about the release of this item will follow soon on our social media channels. Stay tuned! Added a new hat: Easter Bunny Head. This item is NOT a skin, but a standalone item. Further information about the release of this item will follow soon on our social media channels. Stay tuned! Added a new hat: Easter Bunny Mask. This item is NOT a skin, but a standalone item. Further information about the release of this item will follow soon on our social media channels. Stay tuned! Added a new consumable item: Easter Bunny Chocolate. This item is NOT a skin, but a standalone item that players can consume. Further information about the release of this item will follow soon on our social media channels. Stay tuned! Reworked the original "Easter Egg Model". This is now changed into an "Easter Egg Basket". This basket will also be released during the Easter events. This item works like any other skinbox. Further information about the release of this item will follow soon on our social media channels. Stay tuned! Added a new spray: "Happy Easter!". Further information about the release of this item will follow soon on our social media channels. Stay tuned! Added a new spray: "Get Egg'd!". Further information about the release of this item will follow soon on our social media channels. Stay tuned! Added a new spray: "There are no Easter eggs here!". Further information about the release of this item will follow soon on our social media channels. Stay tuned! Added a new skin for the K. Style Helmet: K. Style Helmet Easter Bunny. Further information about the release of this item will follow soon on our social media channels. Stay tuned! Added a new skin for the M. Style Helmet: M. Style Helmet Easter Bunny. Further information about the release of this item will follow soon on our social media channels. Stay tuned! Fixed the item description of the FN57 Vindicator. Fixed the item description and item name of the Riot Shield Geneticzz. Fixed the item description of the Riot Shield Slovakia. Fixed the item description of the M4A1 Hynx. Fixed the QBZ-95 first person crouch idle animation. Fixed a texture issue related to the VSS Vintorez E-Unit. Fixed the texture of the Riot Shield Thailand. It was using the wrong texture. Improved the textures and quality of the normal (unskinned) karambit. All your teddy bear backpacks will now simply be "unskinnable" to a small backpack. Everyone will automatically get the Teddy Bear Backpack skin learned to their account. For all players that had a Teddy Bear Backpack equipped here's what happened: We have emptied your backpack, and put all the items inside in your global inventory. Added the kill-streak number back to the stats menu (when tabbing). Fixed a bug causing you to die in the Lounge (trade server). Doubled the amount of Rocky Ford PVP servers due player demand. Spring Valley and Warm up servers now have random spawns again. Added the thompson to the loot tables. This weapon is now spawning from super zombies, randomly and out of tactical weapon cases. Fixed an issue related to a concrete hole in Campos City where players could get stuck. Fixed some rocks around Glenwood Springs. Fixed / Improved the collision walls around the map. At some places there was holes / walls missing. Added a new area next to Death Valley called West Boulder Outpost. Added a new secret spot. Have fun finding it. Fixed a rock at Campos City where players were able to glitch / walk through. Also fixed some of those rocks around the airport. Fixed some local render distances. Some objects weren't rendering on proper distance. Fixed / Updated some streets that had no ending streets. Removed the big non-textured hills around the map. Removed all the marketplace NPC's from the map since in-game marketplace access got disabled. Removed / fixed the collision that prevented players from entering a certain area. Fixed the collision walls around the white houses where player could get stuck inside. Fixed some miss-placed fences around the church. Fixed a glitch where players could glitch outside of the playable area. Fixed some flying and miss-placed objects. Closed off more rooms in several buildings to prevent players from camping. Removed the repair bench from the map. This was never supposed to be on the map anyways. Added more and new player spawns to create more variation and possibly prevent players from spawn camping. Added more new buildings, props and areas to fill up the map a bit more. Added some more interior objects inside the restaurants, church and markets. Reworked some of the hills in the map: smoothed hills over the map to make it less campy. Reworked the area next to the restaurant and the police station. Added new buildings and reworked the terrain. Reworked the road between the two towns. This place was way too open and there is more cover now. There is also added more player spawns and less hills. Decreased the lighting level to fix certain items glowing too much like the light sword. Increased overall brightness during night time. Night time was a bit too dark. Increased the loot and loot spawns in the airport area. Fixed a false-positive ban where players would sometimes get falsely banned when a Battle Royale starts. Fixed a false-positive kick where players would sometimes randomly get kicked when a Battle Royale starts. Fixed a bug where people had troubles with the sound in Battle Royale. Fixed a bug causing some players Battle Royale sound to not go back to normal. Fixed a bug related to the airdrop system where players could not do damage to each other when being close to airdrops. Fixed visual bugs related to the spectating system. Updated safe zone dome- better quality (round) better transparency (outside bugs fixed) and added new outline to indicate better + sound. Fixed the terrain around the beach (south side) where players could get stuck inside. Fixed some players spawns where players would sometimes spawn outside of the playable area. Fixed certain terrain issues where in some places random water would show. Fixed the concrete next the truck where players could get stuck. Moved the position of some airdrop locations. Also fixed some airdrops dropping outside of the playable area. Lowered the volume of the ambient sounds around the airport area. Increased the size of the lobby. Added missing loot in some places in and around the airport. Added some more various ambient sounds. Fixed a sound glitch on top of the 5-story building in Campos City where the main menu music would sometimes randomly play. Everything regarding the new map is explained in the "Open World" section of these patch notes (read above). You can read all about the new map there. Arrows are now craftable. You need 3 wood and 1 stone to craft 1 arrow. Explosive arrows are now craft-able. You need 1 arrow and 3 gunpowder to craft 1 explosive arrow. Estimated patch size: 215 mb. Patch ETA: March 13, 2018 around 10:00 AM (CET). Estimated downtime: Servers will be down for around 1 hour downtime. Please keep in mind this can always variate. For live patch updates keep updated through our Twitter. M-STYLE FALLEN ANGEL, thats just awesome! I really like that you used my suggestion for the arrows. Tomorrow is going to be patch time again and we would like to announce the patch notes in advance. Once the new map is out for Survival will our current lockers with gear in them be placed in our Global Inventory? Survival will get some much needed love and attention very soon I promise you! If you have requests on what you would like to see added or changed please make a topic on the forums or on discord! How about for that free revive? Sir @Svena69. А почему нет новых скинов Батл Рояль? Говорили же, что будут. It was a bug.. Haha! Servers going down in around 30 minutes. Look at "PATCH ETA" which means "Patch Estimation". It's 09:00 (CET) here now and servers will go down at around 09:30 (CET) / 10:00 (CET). Not sure yet. Most likely we will give players enough time to pick theirs up. We will announce this of course. Anyways, not sure yet.